Sciblogs | An open letter to Declan Waugh – new mechanism for fluoride toxicity? An open letter to Declan Waugh – new mechanism for fluoride toxicity? You describe yourself as a scientist and fluoride researcher so I feel the responsibility to bring to your attention what I think are major flaws in a recent presentation of yours. I am sure you understand that research and the scientific ethos requires and encourages constructive criticism, and in fact the debate over ideas and hypotheses is an essential part of the scientific process. I offer my criticisms with this in mind and therefore assume you will receive them in the same open spirit and give them your honest consideration. 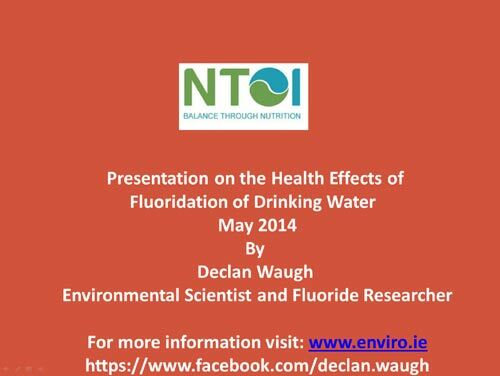 In this presentation to the Nutritional Therapists of Ireland, Health Impacts of Water Fluoridation May 2014 you make several arguments which I think violate basic chemical principles. You then go on to claim a mechanism for many health complaints you claim results from community water fluoridation.This is a novel mechanism because it attributes health problems not to fluoride but to silica resulting from the hydrolysis of fluorosilicates used as fluoridation chemicals. The silica species produce is the monomeric molecule Si(OH)4. This soluble (“reactive”) silica exists in solution but has a very complex chemistry. Polymerisation occurs and a number of molecular species are possible in solution. The end product of such polymerisation can be solid silica but, on the other hand, solid silica can support a concentration of monomeric silica in solution. Yes, molecules in solution are extremely small but it is plain wrong to describe them as if they were just very small, or “ultra fine,” particles of the solid. 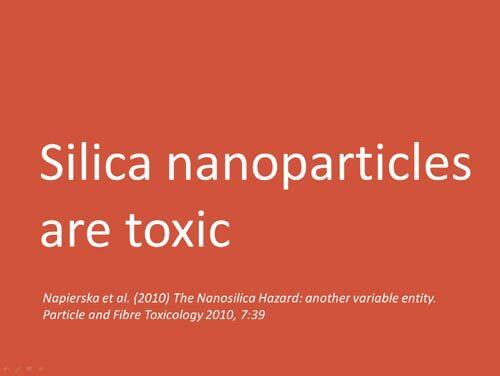 You now go further describing these molecules as “nanoparticles” and cite Napierska et al (2010) to tell viewers that nanoparticles can have negative health effects. They can be toxic. This is a huge leap, on top of the huge leap in the previous slide. No way is it legitimate to describe a small molecule like Si(OH)4 as a “nanoparticle.” One definition of a nanoparticle describes is as a “microscopic particle with at least one dimension less than 100 nm.” Simple molecules like Si(OH)4 are thousands of times smaller. You now put these ideas together to imply that fluoridation can cause a large range of health problems via formation of nanoparticles during hydrolysis of the fluoridation chemical and their toxic reaction in the bloodstream. I believe your arguments here are false, you have not given any evidence to support them, and in fact you have misrepresented the citations you used. Your wild “theory” introduces a big can of worms which you should have considered but actually ignore. Silica, reactive or monomolecuar silica, exists in all drinking water, fluoridated and unfluoridated. Here are some examples from New Zealand community water supplies. Please note, fluoridation is irrelevant. 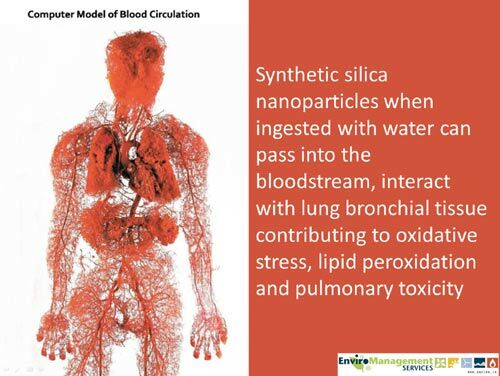 In fact the highest levels of reactive silica occur in an unfluoridated supply. None of this is surprising as silica will be derived from all sorts of natural, geological, sources the water contacts. Did you bother comparing natural levels of reactive silica with what could be expected from the hydrolysis of fluorosilicates? My estimates suggest that fluoridation with fluorosilicate at the optimum level (0.7 mg F/L) would produce a reactive silica concentration of 0.37 mg SiO2/L. 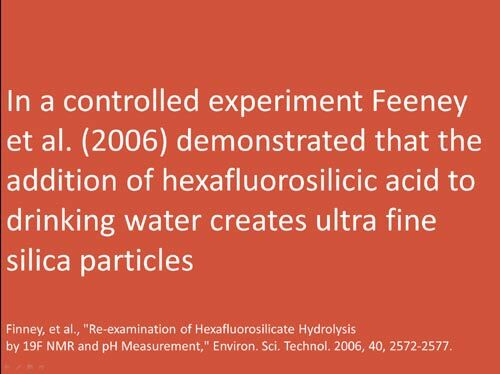 Surely you can agree this is miniscule compared with he natural levels of reactive silica in all drinking waters? Your hypothesis of a toxic role of monomolecular silica in drinking water implies all drinking water is unhealthy and that, in fact, fluoridation could contribute only an insignificant amount to this toxicity. A serious charge which most scientists would consider better justification and evidence than you have given so far. Personally I think it would be irresponsible of you not to publicly withdraw these unwarranted claims. I think there are similar faults in the way you have used statistical health information to imply a link of fluoridation to a whole host of health problems but that is a separate issue. At this stage I look forward to a response to my specific chemical criticisms listed above. If you wish to defend your hypothesis, or to debate this specific issue and the wider claims you are making, I would be happy to offer you space on the Open Parachute blog for an exchange of articles. This proved a very effective method of scientific discussion in my exchange with Paul Connett (see Fluoride Debate). Many anti-fluoridation activists seem to hold you in the same regard as Paul and rely on your for much of their information. You have also contributed submissions to local body councils in New Zealand considering the fluoridation issue. I am sure you would therefore welcome the opportunity to present your scientific claims to a scientifically literate audience that this exchange can offer. Looking forward to a response on this one. Just on the subject of open letters. I’m sure you must have a copy of the response from J Broadbent. As I haven’t seen it yet would you please post a copy, or a link to it. Paul, why are “sure” I have a copy of a letter not sent to me and not involving me? As an aside I would have loved to comment on that open letter myself but the Fluoride Free pages do not allow me to comment. As it was many of the people who did comment there had their comments removed within a few days. Some people really don’t have confidence in their own claims.